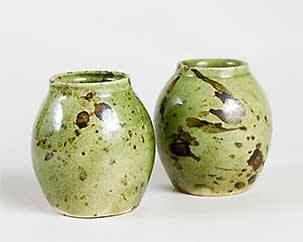 Pair of Zog pots - 2¼" (57 mm) high. Some years ago Ben Sharp came up with the name 'Zog' for a range of small pots. He liked the word, and it was small enough to fit on the tiniest base. After a couple of years of production he learnt that Z.O.G. was used by a political organization that he didn't want to be associated with, and the name was promptly dropped.